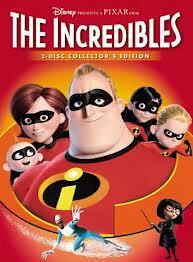 My Take on it – Pixar was on a roll in 2004 when The Incredibles came out. They had 5 hits prior to this one ( Toy Story (1995), A Bugs Life (1998), Toy Story 2 (1999), Monsters Inc. (2001) and Finding Nemo (2004)) and it seemed as if they couldn’t do wrong. With their 6th full length movie, they once again had a hit. Pixar heads brought Brad Bird into their close knit group and he finally got to make the movie he wanted to make for over a decade (He worked at Fox animation which closed in 2001). His previous works were (as writer and director) The Iron Giant (1999) and (as writer) *batteries Not Included (1987). He helped Pixar once again raise the bar on the quality of computer generated animation. Action packed movie which is a spin on James Bond and any superhero movie.